For years I have heard people say “buy links for your competitor and report them”, if it was really that easy and I’m guessing not illegal then we would all be doing it, wouldn’t we ? Sometimes I sit at home at night and pretend I’m the Head of Google’s Spam Team, only I drink wine and not Sprite ;), and what would I do with competitor bowling and buying links in general, so here is what I think I would do. a) Assemble a crack team of Googlers ( I guessing the real head of spam did this ), and create a list of guidelines to send out to 50,000 work at home raters and look for patterns. Things like bad content, over affiliated sites or sites just hitting out of their league, (say a 3 page site ranking top 10 for insurance or loans), sites that shouldn’t be in the top 10. The metrics are truly endless when you start looking into this, you only have to find a few positive signals, is this site is buying links and a quick hand review from any expert spam team or seo and they can tell. So now I have a small section of sites that are seen to be are Selling links and all I need to do is collect all the sites that have out going SEO links and I have my maybe list of link buyers. Then all I need to do is find any correlation appearing on other sites (now my sellers list) and pretty soon I will find the networks. So I have the Networks and Sites selling links, what action do I take? 2) Decent sites, with good content. Reduce the PR as a warning. Site may be hacked or if any dodgy stuff onpage send a WMT warning to try to help get them to clean up, then revisit. 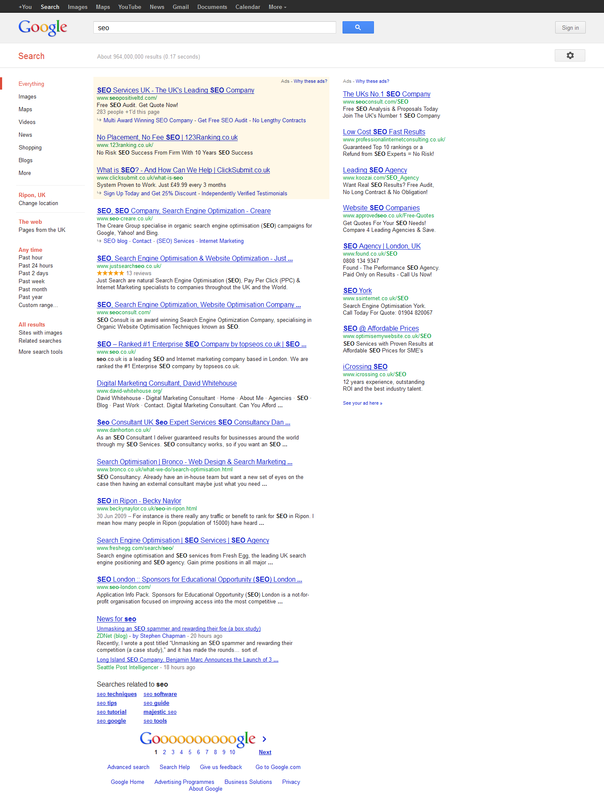 If not cleaned up and SEO links still appear move into the Cat 1 list. Now I have my quota of sites buying links and selling links. I take my spam team out for dinner and tell them to get an early night because we are going to start our “shock and awe” attack on the SEO link buying industry. It’s simple and so easy..
2) Send out unnatural links warnings, the selling ones, and monitor what the reaction is, best guess that any Cat 2’s will clean up and react by removing links that have been sold. 4) Send out unnatural link warnings saying you have been buying links, but lets go crazy and send out to the 50/50’s and the ones we found years ago and wait for the reaction. Some link networks got burnt but there are 10’s of 1,000’s of networks, some sites picked up ranking hits, but what really happened is that 700,000 email warnings were sent. Even if only 20% ( I bet it was more) that’s 140,000 webmasters and SEO agencies starting re-inclusion requests, giving Google the biggest confirmed link buying database ever. Now you start the whole process over again. I think wave 2 has started, I’m guessing it will finish this weekend .. wave 3 in another 4 -5 weeks. Honestly that’s the million dollar question, if you have received a warning you are going have to remove everything, go overboard even, stuff you know wasn’t bought get it nofollowed or removed. Let’s face facts that link on that awesome site that covered your product may have originally looked fine, but if they have been selling links that you didn’t know about you will never convince a Googler that you didn’t pay to place, also don’t be surprised if it’s going to cost you to get the links removed I have seen some reports of link removals costing more than the link placements. Sometimes you are going to have to bite the bullet and face the fact it’s over, all that work you have done is gone ( 301’ing is still working for now so none branded sites have an out but that hole will be fixed and I feel the pain will be worse than what we are seeing now). Branded sites be honest with Google, pull everything you can, anything you can’t get removed have a reason for. But also remember that its only the owner of the WMT account that gets the warning, and even though Google has sent out a ton of warnings there are still a huge amount of people who don’t have WMT installed. All I know is that times are changing and it needed to happen to get the industry straightened out. We’re surprised at the number of companies approaching us who are asking for help getting back in which really helps understand the causes and remedies by being able to access so much data from different industry sectors. Excellent way to identify spam. Tricky part is ‘what action do i take’ bit. Reviewing sites manually could take an age. Google would prob much prefer to borrow your hammer like they do with adwords advertisers! If you’re not using link networks, and by that I assume you mean businesses specifically set up to publish links at the click of a button, do you think high quality blogs (for example) that accept guest posts or write product reviews are also in for a kicking? Where does the good paid vs. bad paid link line get drawn? I personally think that this was a exercise by Google to discover Links Networks. Google asks webmasters to let us know if you know of links networks when you do a re-inclusion request. However the easiest remedy to the issue is not to panic and dilute the SPAM with great quality links. Dave, I’m not sure I follow the logic here – “toxic links can’t hurt your site, so do everything to get the links removed and tell Google…” Um, if they can’t hurt you, why bother spending all that time trying to clean them up? Surely the “ranking penalty” you are experiencing is the loss of link equity from the bad links, not a penalty against your site? You’re only dropping because you have less links than you used to, not because Google is hitting you with a minus-whatever penalty. So, that means we can hurt our competition with low qualitys links all over? Just buy a tons of them in forum profiles, footer links, low quality directories, and wait…. Dave, I’ve been reading about numerous site owners that have what they call “white hat” sites with no ill-gotten links receiving the message in WMT. They mention that they received the notice and didn’t experience rank decreases until 3 – 6 weeks later. What would you say to these people? Google just needs to build a tool in WMT to allow an option to block bad links (a simple tick box, yes pass the juice, or no thanks). I helped a guy here in Australia who got hit by one of these warnings back in January. Yes he had some paid links, but they were a tiny percentage of this overall links (~<0.5%). What he did have though was a lot of in-content links within blog networks and a tonne of obviously self generated web 2.0 links with spun or duplicate articles all pointing back to his homepage. Good insight David, I’m sure we will see a lot of changes over the next 6 month…. Sp was it 1) the reason why Bronco are nowhere to be found for ‘SEO’ ? @SEO Bomber I don’t think Bronco has ever been anywhere for SEO and personally I never wanted rankings for SEO we don’t have a sales team to handle the all the request we get now. Looks like Phase 2 kicked in with a vengeance the last couple of days. Fun times! I have tested if it´s possible to kick out my competitor after i got a message from google about unatural backlinks. I am sure my competitors claimed my ranking to Google. And surprise, you can kick out competitors from google. I thought that google has features to prevent/avoid this. But thats wrong. Google do nothing against it. That the first bad news. The second bad news for me is that i dont know to come out from the google penalty. Yes, i have bought some backlinks and i agree it was stupid. After i have lost a lot positions in google.de i have include the meta code for GWT, then i saw a message about unatural Backlinks. So i saw this message delete the backlinks what i thought was bad backlinks, told google that my competitors has set the backlinks to destroy my rankings and that i have send the website owners a message that they delete the backlinks to my website. Then i have send the conclusion form with the backlinks what are deleted with a big blablabla from my site. Will google recover almost my old rankings? Should i continue in the same amount like before the penalty my backlinks amount daily? thank you for your shared experiences! I must admit that I only ever source around four links to my sites plus a few social media ones and my sites perform well in the serps. By doing the above I have one new site (around 5 months old) in the top 20 for large cruise related terms such as P&O Cruises; Fred Olsen; Cheap Cruises; Cruises from Southampton plus a few more. I guess that by not going hell bent on link-building, my site is working because I am doing what Google wants; trying to gain natural links. That said, I do think Google needs to pay real attention to the fact that a sites rankings can potentially be ruined by someone else. Interesting post and a great one to ponder over while I start to look for work outside of the SEO industry. to all those who have bought, exchanged or rented links, who think that they might have “escaped” from the current updates….. if not tomorrow, but you probably will be next! With their new strategy, updated algos and a huge amount of manpower google has succeded in beating the industry with what they have predicted ever since. SEOs now have to completely change the old fashioned linkbuilding tactics. Buying, exchanging or renting is no longer sustainable (if it ever was). Good link sources might be it today, but will become a possible threat tomorrow. the only way to avoid any “damage” is to really get back to what google wanted ever since: AWESOME content, that will spread virally and attract links naturally. that´s basically the original idea of using links as a metric to evaluate website-qualities. Fishkin&Co have been preaching this for such a long time….. problem was or is the cost for such campaigns! smaller companies or affiliates are not able to pay for that, which has been the main reason nearly everybody was buying links. it was cheap and the ROI was massive in comparison to SEA or display campaigns. This has changed since the end of last year (at least in the german market). we have seen the first WMT-warnings in late december 2011….. Many people thought (and unfortunately still think) this was a one time rollout! but warnings keep coming in every day since then. As David mentioned, we also have so many calls coming in from customers who need help. I reckon this is not the end yet…. Matt Cutts already metioned, that these warning have been issued manually, so they will probably still have a huge database of websites to check and work on. SEO will become much more expensive and there is going to be a massive change in the market. all those who are felxible enough to change strategies succesfully will survice, a lot of companies will die…. it´s interesting and amazing times with a lot of new opportunities and new markets coming up! thanks for this great post David!